Sounds like a dream job doesn't it? Working your summer holidays in fantastic Mediterranean resorts like Ayia Napa, Ibiza, Magaluf, Malia, Tenerife or Zante. Soaking up the sun, having a laugh with new people, drinking, partying, swimming - and earning some money while you are having so much fun. You'd be mad not to want a student job like that wouldn't you!? But is that really what it's like working in jobs as a holiday rep? Isn't the reality actually that you will be working so many hours that you never get a chance to enjoy yourself? And how do you find holiday repping jobs abroad when you are stuck at home in Birmingham or London? What about accommodation? Who pays for the flights? What if something goes wrong. Find out how Summer Takeover can help you make this dream a reality. In this article we want to look into everything and show you how to find holiday rep jobs, what to be aware of before you set off, and what the reality of working as a holiday rep in popular resorts is really like. Why go into things with your eyes closed? How do you work abroad? What's it like working abroad? Holiday Repping Work Is All Foam Parties & Booze Cruises, Right? You may get called on to organise actıivites like that, and you will certainly get at least some free time to enjoy yourself while you are away, but make no mistake, holiday repping can be really hard work with long and often unsociable hours. Six day working weeks are typical and shifts can be 12 hours a day or more. That means you might end up work 70 or more hours a week. You could be meeting people at the airport at three in the morning and still trying to work up enthusiasm for a pool party at three o’clock the following afternoon. What Work Do Holiday Reps Actually Do? Your job as a holiday rep is basically to make sure that holidaymakers have a fantastic time while they are away. You are like a one man or one woman PR person for the tour operator or holiday company you are representing. If holidaymakers have any problems then it is your responsibility to help them find a solution or compromise. If they are looking for information about the resort then it your job as a holiday rep to find out the answers. You may also be involved in sales work for excursions and activities too. If you are good at that sort of thing then you can sometimes earn extra money through commission on any bookings you manage to secure. You will also be used to help organise bar crawls, boat trips, quad bike days out, party nights and other fun activities for your guests in the resort. Are We Making This Sound Tough? Show Me The Money!? But, so long as a bit of graft doesn't phase you, then there are lots of positives about working a summer as a holiday rep. Even the work can be great fun - and the time off can be fantastic. Many students love repping so much that they go back year after year - either to the same resort or different ones each time. But how much can you earn as a holiday rep? Depending on which resort you are working at, how you managed to find the summer job in the first place, and whether commission is involved, you could be earning in the region of £400 to £800 a month. You might also get free accommodation, free (or at least discounted) food and drink, free insurance and a few other perks of the job. And, all the time you are in the resort, you are building up brilliant work experience for your CV. You might even come home with a new second language! How Do Students Find Holiday Repping Jobs Abroad? There are a number of ways of sourcing opportunities for holiday rep work. Firstly, keep an eye out for holiday rep vacancies on our site below, as well as other reputable jobs sites. Also, you may find opportunities in local newspapers, the travel sections of national newspapers, through your careers department or by word of mouth. You should also consider applying direct to tour operators and holiday companies like Thomson, Monarch, Club 18-30, First Choice, Sunsail or Olympic Holidays. If you are lucky enough to secure some holiday repping work directly with one of the big tour operators then your flight and accommodation costs will probably be covered as part of your contract. In most circumstances, they will also look after any visas and work permits that might be required. Although it's probably the trickiest way for students to find holiday rep work, this sort of arrangement usually takes some of the hassle out of the process. Wages will be sorted by a payroll department and they will help with any legal issues you might encounter. If on the other hand you use an agent or intermediary company to find holiday repping jobs then you may have to fork out for your own flights and accommodation. What Other Holiday Resort Jobs Can Students Do? If holiday repping doesn't sound like the sort of overseas job you would enjoy - but you still want to head off to top resorts for the summer, then there are plenty of other work options for students. All of these events and activities throw up ample opportunities for student work abroad, but again, the difficulty lies in finding the vacancies when you have no contacts within the resort itself. If you want a more relaxed way of working abroad and don’t want the stress of repping and just want to enjoy a summer away then Summer Takeover provide a working holiday abroad in Ibiza, Magaluf, Ayia Napa, Zante, Kavos, Malia, Marbella, Tenerife, Sunny Beach Bulgaria & Benidorm. The jobs are night based earning between 30-60 euros per night (dependant on resort and job) and you usually work 6 nights a week whilst having the time of your lives where you can drink for free whilst working and get paid to do it! The jobs vary from selling shots to promoting club events to actually working behind the bar itself! If the whole process of finding holiday rep jobs and sorting out accommodation and flights seems like a complete nightmare scenario, then maybe you should consider using an intermediary company who will help you take care of almost everything. Typically these sort of firms will either take a percent of your wage or you will pay them an upfront fee, so you probably won’t end up earning as much overall as you would if you managed to find your own opportunities direct with a tour operator. These intermediary companies all have their own systems and ways of working, so it pays to look into them carefully so that you know all about their pros and cons, outlay costs and potential wages on offer. Some companies might pay for your flight, but then take the money back out of your earnings. Others will require that you pay for your own flights beforehand. Some will provide accommodation too. 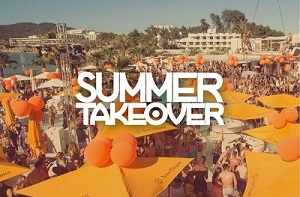 One company that we've worked with to arrange jobs overseas for students is Summer Takeover. They are Europe's number 1 working holiday company so they are well connected in most of the popular resorts where you can find holiday repping jobs and other overseas work. They provide dedicated reps who know the local layout well and organise job trials when you turn up. They also provide guaranteed accommodation for your first four weeks, discount worker bands, and a party intro week to help orientate you. Another aspect we like about Summer Takeover is that they have their own social network where you can meet and chat with other reps for advice. You always feel safer if you know other people doing the same sort of work are just a few clicks away. Summer Takeover packages start at £249 and, if holiday repping isn't for you, they can even help you find some of the other in-resort jobs we mentioned earlier. You can find out more about the setup and see what opportunities are available on our company profile page for Summer Takeover, who have helped people find season work in summer resorts. Apply on your own or with a group of friends for a summer abroad working in bars and clubs. That sounds great, when can I start? The summer holiday repping season runs from roughly April/May until September/October, depending on whereabouts the resort is. If you are interested in a job as a holiday rep during the winter months then ski resort jobs are probably your best option. Childcare Team - work abroad this summer! Want to work in the USA this summer? Childcare Manager - work abroad this summer!